Artwork is dramatic - really helps a very ordinary bathroom. 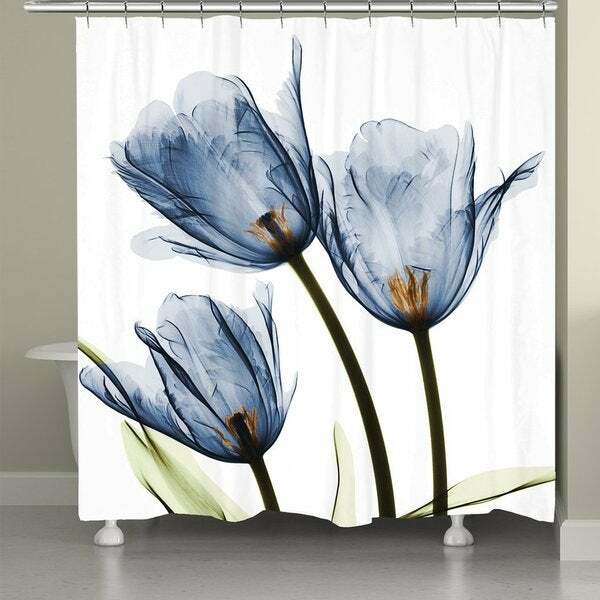 An airy and refreshing addition to any bathroom, the X-Ray blue tulip shower curtain by Laural Home is made from premium polyester fabric and features a unique X-ray style floral image. Digitally printed for crisp and vibrant colors, this excellent curtain is sure to add a touch of natural style to any bathroom. EXCELLENT AND WORKED WONDERFULLY WITH MY BLUE AND WHITE BATHROOM. IT IS ASMALL ONE, BUT THE COLORS GIVES THE ROOM AN EXPANSIVE FEEL. IT DOES NOT FADE AFTER WASHING IN COLD WATER. Gorgeous art in your bathroom. This is so absolutely beautiful It is like art in the bathroom. Mine is all in blue and burgundy and I just love this shower curtain. This shower curtain is just beautiful in my master bathroom. Elegant and modern, the flowers on it are dramatic and really add to the character of the room. Love it! The color is even prettier in person. Unique and different. This shower curtain is so pretty! Exactly how it looks in the picture. Quality material &amp; sewing. Stunning pattern/colors. Love it. Love it! Expensive but I wanted something different and elegant and this is it! adds a touch of elegance, full for good coverage. So beautiful !! Wild Look! "Is the white a true white or is it ivory/cream colored?" "What color blue is it on the tulips "